Valentine’s Day has never been so deadly. Biz Marks is cursed. As a matchmaking witch, she used to adore Valentine’s Day, but that was before a love spell gone wrong mutated into a curse that kills off her boyfriends each February 14th. 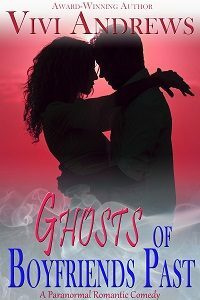 With three exes haunting her, she’s desperate to break the nightmarish spell, especially when a too-gorgeous-to-be-believed reporter arrives in town and starts showing far too much interest in her. Mark Ellison is determined to get to the true story behind Biz’s extraordinarily bad Valentine’s luck. He’s certain it’s no coincidence that her beaus are dropping like flies and leaving her chunks of inheritance money, but Biz is unlike any Black Widow he’s ever imagined. The more Biz tries to keep Mark at a distance to avoid activating the curse, the more determined he becomes. The tenacious reporter won’t quit and she’s starting to realize she doesn’t want him to. This man could finally be the one to steal her heart and break the curse… but will letting him in mean losing him forever?